Leather and Suede can be particularly difficult to dry clean, and a responsible dry cleaner will protect itself from potential legal problems with a release form. 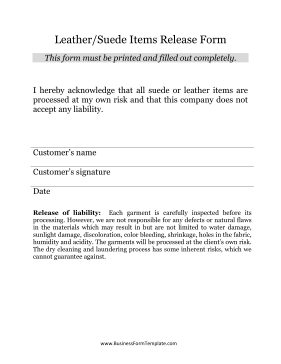 This release form is perfect for small dry cleaners, and will help keep customers informed and the business safe. This form must be printed and filled out completely. I hereby acknowledge that all suede or leather items are processed at my own risk and that this company does not accept any liability. Release of liability: Each garment is carefully inspected before its processing. However, we are not responsible for any defects or natural flaws in the materials which may result in but are not limited to water damage, sunlight damage, discoloration, color bleeding, shrinkage, holes in the fabric, humidity and acidity. The garments will be processed at the client's own risk. The dry cleaning and laundering process has some inherent risks, which we cannot guarantee against.